The host (AFAD) shared information about the on-going project “Disaster Prepared School Campaign” activities taken in the scope of “Safe School”. The role and interoperability of different governmental institutions and measures taken for structural retrofitting in schools were described by the Republic of Turkey Ministry of National Education, while Istanbul Project Coordination Unit (IPCU) created under İstanbul Provincial Special Administration presented the “Istanbul Seismic Risk Mitigation and Emergency Preparedness Project (ISMEP)”. In addition, DPPI SEE participants also shared their national experiences on the topic and further discussed good aspects and weaknesses of related activities in the region of South Eastern Europe. 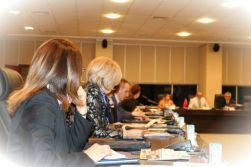 Next to a number of Turkish representatives, 13 participants representing seven (7) DPPI SEE members (Albania, BiH, Croatia, Macedonia, Montenegro, Serbia and Turkey) took part in the platform discussions.